With Samsung having finally just announced its latest flagship effort, the Galaxy S4, it’s inevitable that the comparisons will immediately be drawn between it and some of the other high-end handsets currently gracing the market. Although the iPhone 5 naturally springs to mind, a rivaling vendor, HTC, also finally looks to have delivered a respectable contender to market with the One device. I attended the launch ceremony of the One in Central London, and although I went expecting very little in light of the spec’d-out-yet-disappointing HTC One X and One X+ handsets, I was pleasantly surprised by how much effort and research the Taiwanese company had put into its 2013 effort. Clad in an iPhone 5-esque aluminum unibody, it’s one of the first Android devices to offer something other than the cheapy, plastic build, and if it is to even make a slight dent in the rampant juggernaut that is Samsung’s Android presence, consumers will need to be sold on the build quality. Why is the build such a big deal? Well, as you will see from the comparison chart below, the Samsung Galaxy S4 and HTC One are rather similar in specifications; both offering the very highest-end hardware in the major categories. Those with an affinity to Samsung, or have simply grown used to picking up the latest Galaxy as a matter of second nature, will probably stick to their guns. However, for those who like to assess the market and newer handsets before coming to a decision, HTC could certainly sneak some of that precious market share back from its Korean rival. The iPhone 5, meanwhile, just has to be included in the comparison purely because of its status, and although it’s half a generation behind these two Android titans, the Cupertino flagship still knows how to party. 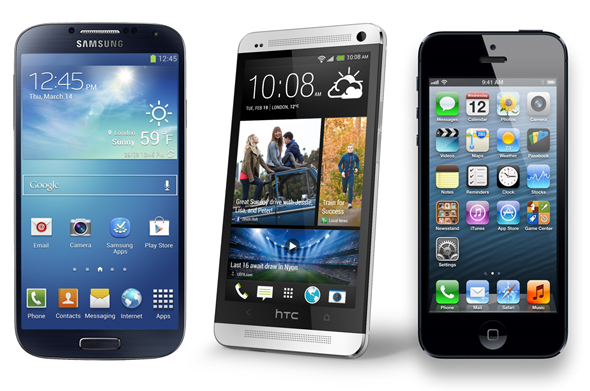 Whether you opt for the Galaxy S4, the HTC One or the iPhone 5 is entirely your prerogative, but if you want an objective run-down of how the big three smartphones fare against each other, you’ve come to the right place. As you can see, there’s very little to call between the two Androids. Personally, the S4 looks very similar to the S III and Galaxy Note II, which sways me to prefer the HTC offering. That said, I have had the benefit of a hands-on with the One, and until I have given the S4 a proper real-world test, I will have to reserve definitive judgment. The 2012-released iPhone 5 is decidedly inferior in nearly all categories, but since the device is now over six months old, and is due for a refresh around September, it would seem a little harsh to make too much of its vast shortcomings against the new benchmarks expected of a 2013 release. Does that mean the so-called "iPhone 5S" will match these two Androids on paper? Probably not, since Apple makes a habit of holding back features far longer than many deem necessary. But at least if we were to wait and see what Apple has up its sleeve for 2013, we could perhaps have something of a fairer test. Having seen just how impressive the UltraPixel snapper of the HTC One is, I would suggest prospective upgraders, particularly photography aficionados, think very carefully before making any, ahem, snap decisions. The Galaxy S III’s 8-megapixel snapper was easily the worst-performing of the previous-gen flagships, and although 13-megapixel shooter may render it identical to the HTC offering in the eyes of many consumers, we know differently. The Galaxy S4, to its credit, is thinner and lighter than its Taiwanese counterpart, and considering it also packs in more batter power at 2,600 mAh, Samsung has done incredibly well to cram everything in. The iPhone 5, meanwhile, has been lauded as a piece of engineering brilliance from Apple, and whether you love or loathe the fruit company, there’s little denying the build quality of its most recent flagship smartphone. In the coming days and weeks, as the reviews begin to roll through, we’ll have a much better idea of how ‘evenly matched’ these two as-yet unreleased Android phones are, but as you can see from the charts, there’s very little to call between them at this point in time. The iPhone 5 is a little antiquated already, but will still continue to sell in large numbers in the next few months, particularly with many consumers shaking off their 18-month iPhone 4S contracts. Which, of these three Goliaths in the smartphone world, could you see yourself going out to buy, what with two of them scheduled for a Q2 release? Please do share your thoughts via the usual mediums below!